Players Profile: Ivan is a strong player, sharp and aggressive in defense, with good header skills. He is very active in the field, working a lot for the team. He has good technical skills to start the game from defense. Ivan is a leader in and outside the field. Achievements: April 2016: Trial at Norwich City FC. 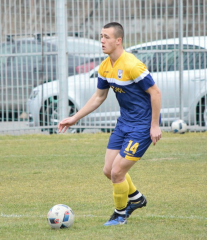 September 2015: Youngest player to score in the Bulgarian L3 championship. Since 2015: International player U19. Other Information: Ivan is a product of PSFC Chernomorets Bourgas Academy.